Win, Lose or Draw : The First of many 2013 Election debates. I’m Backing Rudd’s Plan; does that make me a monster? “STOP THE BOATS”: Stronger borders…but at what cost? 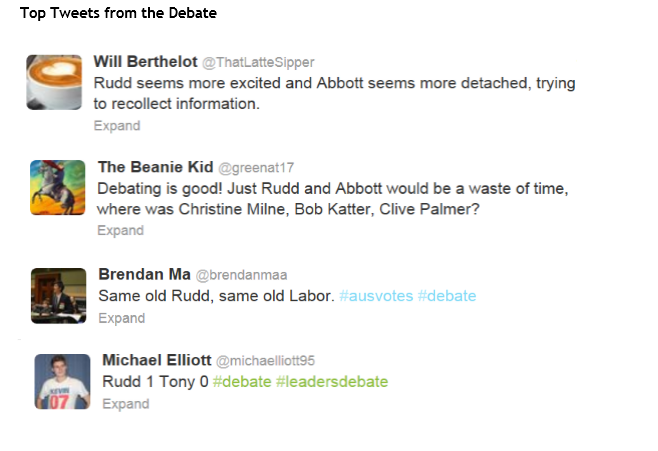 Comments from Former Youth MP’s on Last Night’s Debate. ‘I was a bit disappointed with the debate tonight. I thought that it Kevin Rudd was solid. He was solid on Labor’s record. He was solid on how he would take the country forward post the mining boom. He did stumble on the 2nd Sydney Airport and I didn’t feel he had enough time to make an appropriate announcement about his plans for Marriage Equality in the next parliament. In terms of Tony Abbott, I felt he looked a bit flat. He was talking about aspirations rather than concrete plans. He particularly stumbled on the budget. However, this election is his to lose. I feel that if he is smart, he will play the small target on how he will fund the budget. To announce a 1.5% Company Tax cut, abolishing the Carbon & Mining Taxes whilst keeping the Carbon Tax compensation, Gonski, NDIS & NBN, it seems that to balance the budget, he would need to make some unpopular cuts and the effect of the attack from Labor would be much less over lack of disclosure rather than giving Labor the ammo to go to town on deeply unpopular cuts.” – Daniel Turner, Former Youth MLC and Youth Parliamentarian of the Year 2013. In my opinion, neither candidate outdid each other. Whilst both performed in their own rights, Abbott’s detachment and lack of engagement was outweighed by Rudd’s visible excitement, but the use of notes by Rudd also detracted from the experienced and made it feel scripted. Abbott presented an image of himself rather than that of a statesman, but that of someone lacking charisma – however, similar statements could be made for Rudd. No candidate won, but both merely responded loosely to a question given and attacked other irrelevant policies. – William Berthelot Former Youth Member for Pittwater 2012 and Former Youth MLC 2013. By Geeth Geeganage , Former Youth Member for Blacktown, Youth Opposition Leader 2012 and NSW Youth Governor 2013. Today, I’m dealing with a complex issue. And it’s going to be tough. It probably won’t win any votes with my friends, nor continue my tendency to push to populists causes. But I believe educated debate on issues is vital to our dynamic political system. This is an issue I have been grappling with for a while now, and the decision I have come to has not been easy for me. How do I stay progressive and socially aware while also holding strong and heavy handed views on how Australia should deal with issues that stem from people seeking asylum by boat? I am a strong believer in Australia as a progressive, multicultural nation which allows individuals – irrespective of their skin colour, religion or race – to make a life for themselves. Does supporting Rudd’s policy on asylum seekers make me a monster? As the University of Sydney Greens have said; it is something that will “haunt [me] to [my] dying days”…. People closest to me have always known how I felt…. I agree with Rudd’s policy. Not because it will win votes in marginal seats. Not because people think refugees are ‘illegal’. And I’m not speaking as a Labor Hack… I think it is a smart policy because I don’t want to see more people dying at sea by coming on leaky boats. How is that a humane way of dealing with things? The people smugglers indoctrinating people with lies and deceit; are feeding off the despair of these vulnerable people fleeing nations and they must be stopped. For every boat we find or know about going down in the Indian Ocean… How many do you think have gone under without anyone knowing, without a single whisper? It is easy for the extreme left to sensationalise this issue and make it all about ‘ Kevin Rudd’ surging to the right and leaving ‘refugees to rot’ in PNG. But this issue is so complex that a trivialised social media campaign does not do it justice. I’d like to also add, that our humanitarian intake of refugees is disgracefully low. There is no need for such a low number, and I think this feeds into the boat arrivals problem. I am a massive advocate for the increased intake of refugees from camps around the world. What I’m not an advocate for is, the scum of the earth – people smugglers – that feed poor innocent people looking for a better life, lies and deceit. Left of centre governments have always looked to influence ‘business’ behaviour with strong deterrents, so why doesn’t that principle apply to the people smuggling trade? These people need to be stopped and sending a strong signal that Australia will not accept seekers of asylum that come by boat is a very harsh, but necessary step in a long process of reforming the balance between border protection and meeting [increasing] our humanitarian obligations. Having a fair and balanced way of decision making is a key to having any sort of moral grounding. So I apologise for not jumping on the bandwagon of mass hate for this policy announcement on social media. Rather, I, at the moment, in its current state, feel as though I support it, but will wait for further detail to be released. The sad fact of the matter is that legitimate refugees, fleeing death or persecution, have a much better chance of a safe, healthy and better life in PNG than in a body bag in Afghanistan or at the bottom of the Indian Ocean. This policy sends out a strong message; Economic Migrants, People Smugglers, paying for your ticket on a leaky boat does not mean you will be arriving in Australia. Under the current system people seeking asylum via boat are detained for long periods… and often indefinitely. Are you telling me an immediate resettlement program, in a country that is a signatory to the UN Convention on Refugees, is worse than indefinite detention? I leave you with this: respect in discussion is such an important thing. Being labelled a racist or murderer is a very big call. If you wish to have a reasonable, constructive debate, I highly respect that but if you simply want to add to the vitriol currently plaguing Australian politics with name calling and ‘one liners’ or in some cases ‘ 3 worders’ then please: take your filth somewhere else. Whilst I know it’s a bit unfashionable to speak in favour of stopping the asylum seeker deaths at sea, today I have become so dismayed by public opinion that it is time to offer an alternative policy. This is not the result of being a bleeding heart, nor is it from being a refugee advocate, I am neither. Rather, it is the result of the horrifying number of lives lost by refugees seeking to come to Australia, and the reaction of the major parties which I find so unacceptable that I will propose my own new policy. · Australia funds the transit of refugees from their nations to Australia, chartering boats in order to remove the black market for people smugglers. These people would still be subject to offshore processing, however they would be safe from drowning at sea in what might best be described as glorified colanders. If offshore processing centers become full, more onshore processing centers should be established to cope with level of demand. · People found to be ‘genuine’ refugees will be granted Temporary Protection Visas and will be eligible for citizenship after its expiration, subject to good behaviour. · Refugees applying to come to Australia through more regular avenues will not be disadvantaged as the refugee intake should be adjusted according to need, with assistance from the United Nations Refugee Agency to adequately determine that level. · Refugees would be placed in housing in different places in the nation, with priority for areas in need of population boosts. · Refugees would be encouraged, though not obliged, to work on nation building projects, especially those designed at improving the coping capacity for essential infrastructure which are used by new Australians. · Persons not found to be genuine refugees would have the option of remaining at the processing centers until their claim for residency could be properly accommodated, or alternatively, could return back to their place of origin. · In order to protect the lives of the so-called “boat people”, particularly the children, any boat arriving seeking asylum apart from the official chartered government boats would be either towed to an offshore processing centre or would be turned back. · Particular priority should be granted to Iraqis and Afghans displaced as a result of Coalition involvement in those respective conflicts. It is presently obvious that the existing Commonwealth Government policy is not working and since it is almost certain that the Indonesian Government is almost certain NOT to accept boats being towed back into their waters. Further, the Australian Navy, or at least former servicemen have stated that the policy of boarding the vessels and towing them is risking the lives of personnel and, as such, should be rejected. My solution is far from perfect, though it provides a way of maintaining fairly secure borders while not jeopardising the lives of asylum seekers, and, more importantly, the children aboard who were brought without any choice. This is more important that jingoism and xenophobia, one does not have to ‘like’ asylum seekers to understand that they should not die at sea, and whatever the sins of the parents, it is wholly unacceptable for a society to allow the continued deaths of children at sea. While tentatively supporting the Howard Government’s policy on border security, not for humanitarian reasons but because tragedies at sea were extremely limited by comparison to today, this goes beyond the notion of “we will decide who comes to this country and the circumstances in which they come”. It even goes beyond border protection itself. It goes all the way to compassion, and that, if we want to be a great society, is the most important policy of all. What a year. What a Week. What a time in my life. Being the YMCA NSW Youth Governor for the last year has been amazing but I step down, knowing that my successor is the right person for the role and will undoubtedly do an amazing job! This blog is dedicated to the hand over! Whether it is the expansion of the program to the Legislative Chamber, speaking in front of the Premier of NSW, witnessing some of the most amazing debates I have ever witnessed or being an advisor for the first time… YP2013 has been the greatest learning experience of my life and I hope I have done the position justice. by James M Jeffree, former Youth Member for Kur-ring-gai. Crucial to Australia’s continual success is the much derided ‘middle–man’. This individual takes many forms, hides within all political parties, even sits next to you on the train. They are the centrist. They are the every man. They embody the true Australian political conscience. And, they will choose the next government of Australia. When they were only 20 per cent of the electorate, they had influence, but now they stand at 40 base points. The shift makes the swing vote, the centrist, – whatever you chose to call them – more important than before. Political parties are ignoring this fact. Partisanship fuels Australia’s political media cycle. Labor speaks. Liberals respond. So it goes. Increasing partisanship breeds discontent in the electorate: seen since Rudd’s ousting and the 2010 Election. Instead of intelligible debate we’ve seen bickering expected of preschoolers. Instead of sound policy, we’ve experienced the effects of insanity. Neither side stays safe from this critique. The dominating quirk of the electorate and politicians who govern is a short memory. Julia Gillard lied about a carbon tax, but Abbott was willing to climb into bed with the Greens. Abbott is negative, but so were Beazley, Crean, Latham and Rudd. The opposition are not a shadow government, but the sovereigns representatives keeping government to account. Yet, all of this has been lost on Australians, and this reoccurring amnesia causes extreme partisanship to emerge. Partisanship marginalises the centre when it turns to the fringes. Exacerbating this is a hung parliament, and the Greens holding the balance of power in the Senate. The Greens are extreme when compared to both major parties, and the crossbenchers are one–issue candidates. In America one–issue campaigns command a majority, and the hung parliament in Australia makes this a problem here. Sensible policy always focusses to the centre, and Australia has lacked this in the current Parliament. Confusion exists within the current government why their reform programs are not being well received. Yet comparing the Gillard Government’s reforms to the reforms undertook by both Hawke, Keating, and Howard and Costello clears the confusion. Floating the dollar, and the GST while radical were not politcally extreme reforms. A carbon tax, and the failed media control reforms are. Why? They uphold idealogical, rather than pragmatic ideals. The centre are not ideological; the centre are pragmatic. Ignoring this ultimately may be Gillard’s undoing. The Liberals do not escape scorn either. Dismissing the notion an opposition must release policy, with costing, before the May budget (for this unprecedented expectation is diversionary at best), still does not excuse many of the policy suggestions so far. Continuing on the theme of environmentalism, a ‘Green Army’ seems at best an inefficient use of resources. It is not needed. Abbott’s promise of a surplus in the first Coalition budget another. Promises are made to be broken. Abbott and Hockey do not have the books, promising something without the facts is dangerous precedent to lay the foundations of a campaign based on economic management upon. Both parties currently move towards extremes on the politically spectrum at the expense of the swing voter. This shift was first seen with Howard moving to the right to take away One Nation’s support base. A necessity, perhaps, but a precedent we may later regret. Pragmatic policy lacks political support, except for the NBN. Both agree on having one, now the groundworks in place, but disagree on how to implement it. Australia’s political landscape is fraught by partisanship. And, not the constructive kind. Our political leaders must return to pragmatic policy, rather than ideologically driven policy. Both sides must accept responsibility for the mess we have currently. And, the party that can do this before September 14 will win the election. By Mitch Dudley, Youth Member for Hornsby 2010. In 2007 there were 65,300 reported attempted suicides in Australia. In 2010, 2,361 people lost their lives. That is 45 people a week. 45 people with families, friends, dreams and aspirations that end so suddenly. I have personally lost four close friends to suicide, and have attempted to take my own life twice. Many people reading this may be uncomfortable reading that. That is what we need to change. We need to start talking about suicide honestly and openly. I feel this problem wherever I go. In a world of isolation and fear, we are neglecting those most in need. We need to start talking openly and honestly about suicide. It impacts upon everyone. Today there is a massive stigma surrounding the issue of suicide. It is not an acceptable thing to talk about. Why? It really defies belief. With a more open and inclusive dialogue on the issue, I do believe that 2,361 would be a lot less. Those 65,300 that attempted would feel a lot better about going back into the world. Out of those 65,300 people who attempted, if they attempt to take their own lives again they are 37 times more likely to succeed. Only through awareness of these issues can we start to break down the barrier surrounding this. Take the time, read about these issues and be prepared to talk about them. It feels like it doesn’t occur, the numbers say otherwise. How should we address this? As a society we should be prepared to speak about these issues because for too long, they have been ignored. It is a case of being aware that these problems exist, and being prepared to talk to our friends and family about them. Only then can we break down the stigma associated with suicide. The Mental Health Commission in a recent report stated that we must “overcome the silence in the community around suicide.” This can only be done through awareness of these issues that has led to the stigmatisation of suicide. Talk. Those 65,300 people will be relieved that they can talk freely without fear. Those 2,361 deaths are preventable. It is up to us as a society to destigmatise this issue. This will save lives. The four friends I have lost to suicide had voices. We have voices. Let’s ensure no one else loses theirs. We need to start the conversation urgently. by James M Jeffree, former Youth Member for Kur-ring-gai 2012. Since the Howard era an obsession for surplus has left this country susceptible to long–term malaise. I do not discredit the importance of surplus. Instead, I worry that assumptions by the economic illiterate or weak–willed politicians, on both sides, is dangerous to the continual growth of this nation. Great things were achieved by the Howard government. ‘Surplus hunting’ is one of them. Surpluses have their place, but so do deficits. A chief aim of government is economic growth, but looking to the government for such growth is foolish. Economic growth occurs outside of government input; its occurrence, or lack of, is controlled more so by structural factors. Good politics would wish to suggest otherwise. Positive economic conditions caused by governments are rare, but negative economic conditions caused by them are common. Yet, to suggest the size of government debt is inconsequential to the stability of an economy is also a mistake. Since World War Two, the United States has never paid off a debt. Their debt becomes larger as each year passes. Until 2008 this was insignificant. What increased alongside government debt in America was the size of their economy: rated most effectively by the GDP. When the health of an economy is analysed, often, debt-to-GDP as a ratio is used. While government debt increased, the US debt–to–GDP ratio fell from 121 per cent to 32 per cent. Throughout this period, the United States became the most powerful nation. Currently the ratio stands at approximately 23 per cent while it’s lowest was approximately 10 per cent under Howard and then Rudd (2007–2008). However, to call the Howard Government effective economic managers and the Gillard Government ineffective simplifies and exaggerates government influence on the economy. The GDP barely increased in Howard’s first ten years, and has increased exponentially under Labor. If government debt affected the economy as strongly as we are told, then under Labor our economy would be in ruin. The economy is not in ruin, so government debt does not affect the economy as much as we would think. All it shows us is the Howard Government was excellent at managing government books, while the Gillard Government is not, while the economy grows on its own accord. Current political discourse focuses on whether governments can afford things. I argue the focus should not be on how much a government spends; rather, what the government spends it on. The issue that needs to be addressed is not the current government debt, but the inefficiencies in expenditure and government programs that are causing the debt to increase. However, I will leave this for another article. Political analysis has confused cause and effect. Government debt cannot be the cause of bad government, but bad government may be the cause of government debt.